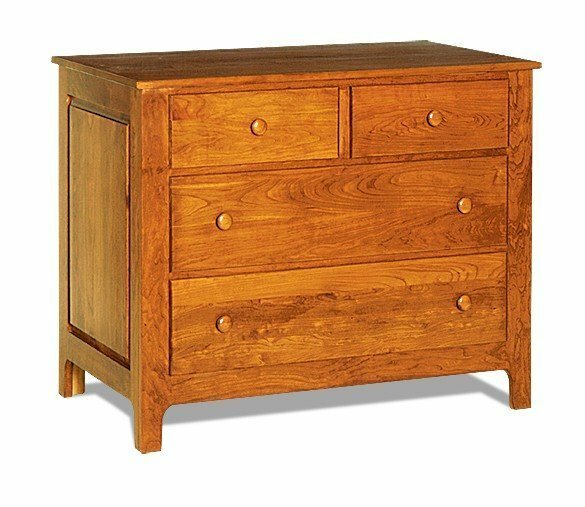 Our handcrafted Shaker Style Dresser is simple beauty at its best! This Amish dresser is made from solid wood and beautifully finished. Our cherry wood with a natural finish is the most popular choice for our Shaker furniture however you can choose to have it made in oak wood or a custom wood request such as maple. The wood is complemented by the beautiful raised panel sides and wood knobs. This small four drawer dresser measures just 42" wide and 34" high so its perfect for the guest bedroom or a children's room. The dresser drawers are dovetailed for added strength. Choose from our 3 drawer slide options to customize the dresser. This Shaker Single Dresser comes without a mirror but you can add a complementary Shaker Mirror. This furniture is custom made for each customer so please allow for 6 to 10 weeks for it to be built. If you are looking for an instock item, custom sizes or have questions please call one of our Amish furniture specialists at 1-866-272-6773.